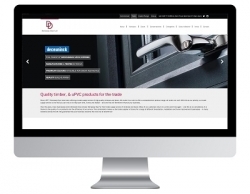 Respected fabricator Dempsey Dyer has unveiled a brand-new website to coincide with its fortieth anniversary. The cutting-edge site, designed by industry marketing specialists Purplex, showcases the vast range of quality timber and uPVC windows, doors and conservatories the Pontefract firm has to offer. Structured around the three core areas of Dempsey Dyer’s business, the site features one section promoting its services to trade customers, one section focusing on its respected and increasingly in-demand commercial installations service, and one section dedicated to its consumer-facing Inspire brand. Fully optimised for display on mobile devices, and packed with the kind of clear, engaging content that Google rewards with high search rankings, the new site is a fantastic introduction to Dempsey Dyer, its long history, and the extensive range of products it provides. “We’re absolutely delighted with the new site,” commented company Managing Director Peter Dyer. “It’s the perfect way to celebrate our fortieth anniversary, and lets us start the next forty years as we mean to go on.